Pianist Meg Morley has her debut trio album Can't Get Started out and ready for its launch later this month. Brianna McClean spoke to her for LondonJazz News. As pianist and composer Meg Morley introduces herself, her sunny disposition (perhaps due to her vitamin D-soaked Australian upbringing) is evident. After a successful career in the classical world, Meg has found herself as a jazz musician on the London scene. In conversation with her, a story of both geographical and musical transition emerges. Meg describes her initial experiences of jazz, at the renowned Victorian College of the Arts at the University of Melbourne, as “overwhelming, in a good way”. Meg Morley: With so many new things thrown at me, afterwards I didn't know exactly what to do with music – as a career. So I packed up, and did the classic Antipodean thing of travelling for a number of months, then came to London to see if I could find work as a musician. > After working as a pianist for the English National Ballet School for a time, Meg began to pursue writing and performing original music. 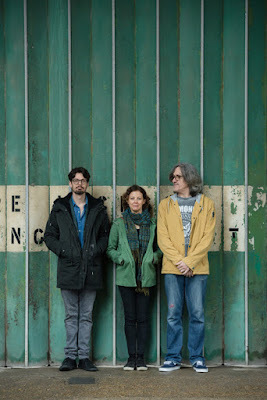 Fast-forward a few years and the Meg Morley Trio has just released its debut album, Can’t Get Started, a collaboration with bassist Richard Sadler and drummer Emiliano Caroselli. LJN: Congratulations on the recent release of the debut album for your trio, Can’t Get Started. How would you describe this record? MM: I'd describe it as a first attempt to seriously put stuff out there! That's not meant to be a cop-out answer, because the intention really was purely to make a record. The transition between ballet accompaniment and a jazz trio is not a natural progression, yet Meg seems to pull it off seamlessly. This is where the conversation headed next as Meg spoke about her experiences of both genres. MM: For me, it's been about finding a voice and then a place where you can express and develop it. In my experience, in the classical institution, the aim of reproducing someone else's idea note for note can be impeding because sometimes the meaning can be lost if you're focused on giving a perfect rendition. I'm not saying that you don't need to play the 'right' notes in jazz but I just think there's a different philosophy or mentality behind these two worlds … I feel like the 'jazz world' is more the place for me. The technical accuracy of her classical training is melded with a new found energy in Meg’s recent record. “This is just the beginning,” says Meg. Any listener of this successful debut album cannot help but agree. LJN: Does the album tell a story or have a particular overall shape to it? If so, what is it? MM: I don't know if it tells a story as a whole – maybe that could be left to interpretations. I feel that each tune has a story and I think there's a satisfying shape in general. For the next album I think I'll have an overall concept in mind though – it possibly makes things easier, in terms of setting yourself parameters. Meg’s history is highlighted as she describes her greatest influences. While many jazz musicians would list canonical names from Coltrane to Fitzgerald, Meg’s inspirations are closer to home. MM: I think personal connections have the most influence for me, so if it's a musician it's often one I know. I really admire David Walters (British pianist). When I first heard him improvise for a contemporary dance class I was amazed. It was inspiring and so removed from my own playing – hearing the piano treated as a percussion instrument, because I think fundamentally I'm fairly ‘lyrical’. Unfortunately there's no recordings of his piano playing – you’d have to catch him in a dance class! He's brilliant. When asked about her philosophy as a musician, Meg says that she wants to “take people on an interesting journey”. Her own journey has not only been a musical one, but a physical one. She is one of many Australians who make the musical pilgrimage to the Northern Hemisphere. LJN: What is attractive about the London jazz scene? MM: There’s so much opportunity and work. And, in terms of writing original music, I think that there'll always be someone listening somewhere. I think it's a great place in which to develop too – because there's so much going on. LJN: What effect, if any, do your Australian roots have on your work as a musician or the sound you create? MM: I don't think Australians are really recognised in the UK as having a particular sound, style or label (apart from the occasional derogatory 'uncultured buffoons' maybe!). However, often when I listen to some of the wonderful original music that comes out of Australia I hear a particular sound – although I can't exactly describe what that is yet. As an enthusiastic new voice on the London jazz scene, Meg is sure to delight audiences for many more years. Her career is testament to the diversity which is embraced by this genre and community. The Meg Morley Trio will officially launch its new Album, Can’t Get Started, at Vortex Jazz Club on 23 February 2018. Like the UK, there are many exciting female musicians down here in Oz. It's a very vibrant scene. Get down here and experience it, sometime.